Officer Trahan decided to contact a local dentist, Dr. Ashok Mehta of Southland Dental Arts, and inquired if he would be willing to assist with providing dental care. He agreed and began treating Ms. Harvey, providing her with dentures. Dr. Mehta donated his time and only charged for lab fees. Officer Trahan contacted the Tustin Police Foundation and they offered to pay the $500.00 lab fees. 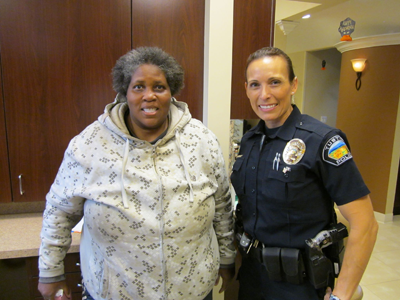 Officer Trahan was also able to find shelter for Ms. Harvey at the Village of Hope. She is very thankful for Officer Trahan’s compassion, and is very grateful to be at the Village of Hope where she is learning a new vocation so she can become a productive member of society again! Comments on "Service with a NEW Smile"